We love Passive Houses. 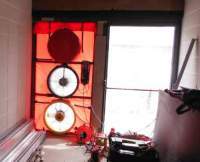 Please see the Passive House page for some details on airtightness testing of Passive houses. Heat loss because of unwanted air movements can account for a large proportion of your heating use - in a very well insulated and airtight building it may be less than 10%, but in a modern well insulated building that is poorly draught sealed it may be up to 50%. In existing buildings it would be anywhere in between these numbers. There may be noticeable draughts, or in many modern homes and offices there may be just a feeling that it is colder than it should be. 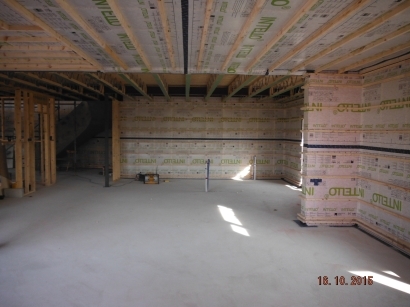 GreenBuild can help you address airtightness at any stage in your build or renovation. The earlier it is factored in, the better. We can undertake pre-planning information sessions, plan reviews, and site inspections, to ensure that the building is being made as air-tight as possible. 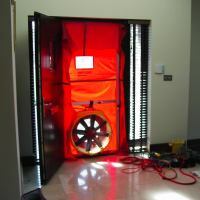 Blower door testing, or air pressure testing, allows the accurate measurement of air movements through the fabric of your building. Using calibrated equipment in a standardised test manner allows a result which can then be compared against other properties, or earlier tests to the same property. Greenbuild provides results in Air Changes per hour (n50) and in the regulation m3/(hr.m2)(also called q50 or qe50 in the more recent I.S. EN ISO 9972:2015). Air changes per hour is the number of times per hour that the entire volume of the heatable part of the building would be changed, while m3/(hr.m2) measures the air leakages relative to the size of the envelope of the building. Whichever unit of measurement is used - the lower the result, the more airtight the building. During the test, a pressure difference is achieved between inside and outside of 50 Pascals, and the amount of air through the fan is then measured. To arrive at value of the building in use, an approximate result is found by dividing the result at 50 Pascals by 20. Thus 10 air changes per hour at 50 Pascals is about 0.5 changes at normal conditions. Greenbuild is audited by NSAI to ensure our testing is in conformity with the required standards, and we have been authorised to test using single fan and multi fan test equipment. The standards most commonly tested to are I.S. EN ISO 9972:2015 and the older EN 13829:2000. While the pressure test is being undertaken, the opportunity is there to find the leaky areas which are allowing the air through the fabric of the building. This is normally done simply by hand, or with thermal imaging, thermal anemometry and smoke. The smoke machine allows leaky spots to be located, particularly around windows and doors. An example of this is to depressurise the house (i.e. extract air from it with the fan) and then, standing outside, blow smoke using a small smoke gun around the window ope. A person on the inside can then locate where the smoke, and thus the air, is entering the house. Using thermal imaging - when the house is depressurised then colder outside air traversing the fabric of the building shows up well on the camera, and thus gives away the location of the entrance points into the living space, as well as oftentimes showing up the otherwise hidden route behind the surface. This is possible because, even though the camera does not x-ray the structure, the cold air moving behind the surfaces cool them down, allowing the camera to pick up the pathways. 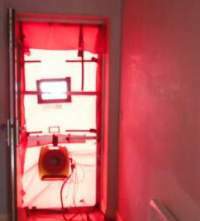 Whilst the smoke and thermal imaging camera are excellent for locating the leaks, the thermal anemometer gives an indication of the severity of the leaks. Using the thermal anemometer the air speed is measured at the access points, allowing for comparisons and for the leaks to be prioritised by severity. Much of the cold felt at home in Ireland is due to air movement - drafts and air leaks. We offer various levels of draught testing services from simple walk arounds, with little or no equipment, just an experienced eye, up to full draft inventory with report on how it may be tackled.